A stylish and slick adaptation of Agatha Christie’s famous detective novel uses a stacked cast and clever filmmaking to hide the story’s age. The one star not listed in the cast? Hercule Poirot’s magnificent mustache. The Popcorn Diet is a podcast for those who live on a steady diet of movie theater popcorn and other movie snacks! Like, rate, & subscribe now on iTunes, Stitcher, SoundCloud, or Google Play and follow us on Facebook, Twitter, and Instagram! There have been numerous studies conducted, be it by 34 years of research or by artificial intelligence, that have broken down what storytelling is, how it has evolved, and ultimately, what it boils down to. Ultimately, humanity has been storytellers since the beginning of time, and we’re simply running out of stories to tell and ways in which to tell them. One could argue that without a unique artistic flourish or a new medium, there is very little thrill left in thrillers, too few laughs in comedies, and not enough mystery in mysteries. Certainly even the great 1934 work of Agatha Christie is subject to this same diminishing rate of return, having become world-renowned in the nearly 85 years since its initial release. Many purveyors of grand literature, twisty mysteries, and detective stories are plenty familiar with Christie’s quirky Belgian detective Hercule Poirot, and his detective adventures no longer hold the same type of awe that they once have. That doesn’t mean they aren’t ripe for adaptation, and it is a genuine shock that is has taken a modern filmmaker this long to try and spin Poirot’s many cases into a franchise that studios so desperately seek nowadays. Sir Kenneth Branagh is no stranger to works of grand literature and storytelling, having constantly been one to tackle not only the works of William Shakespeare, but also dabble in the storytelling worlds of Mary Shelley, J.K Rowling, Disney, and even Marvel. It seems all too perfect of a fit for him to take on a larger-than-life literary character such as Poirot not only as a director but also as an actor, donning what must be the finest cinematic mustache in recent years for a clever, polished retelling of one of Poirot’s most famous mysteries. Living in a world of pop culture that now has detective mysteries playing on basic cable 5 nights a week, it’s refreshing that even though the twists themselves may not be all that astounding, we can still get a hell of a great looking film with a wonderful cast out of the deal. Branagh gets what makes Hercule Poirot such and interesting character to begin with, in that he’s almost an inherently comic character in his self-assuredness. He is an impeccably composed man, they type of man who rejects dual hard boiled eggs because they’re not symmetrical. He’s the type of man that sleeps with a mustache guard, who giggles and laughs as he reads A Tale of Two Cities, and who simply cannot handle the little imbalances in life, such as injustice. Playing Poirot as a man who is aware of his quirks, happily apologizing but never changing, Branagh brings a fun playfulness to a character who is utterly serious in finding the truth and making sure justice is served. He’s a wonderful central character, one who I would happily see tackle any of his many mysteries on the big screen again. The rest of the cast is filled with an absolutely murders row of talent, from veterans such as Derek Jacobi, Willem Dafoe, and Judi Dench to rising stars like Josh Gad, Daisy Ridley, and Leslie Odom Jr, trying to figure out just who might be the guilty party is a fun exercise in analyzing performances, even if the parts are all cut a bit short due to the size of the cast itself. Michelle Pfeiffer is the most memorable of the cast, getting a few meaty scenes to chew into, and Johnny Depp is excellent in his few scenes as well, underplaying his dark, dangerous character very well. Branagh and writer Michael Green also make a few smart racial switches between some characters. The Italian car dealer in the original is now a Cuban. The Swedish missionary now a Spaniard played by Penelope Cruz. Even Odom Jr’s casting as the Doctor introduces some clever racial motivations and reactions that might have otherwise been absent. The film ultimately still falters as a mystery, with some of the reveals falling flat due to the vastness of the cast of characters and the unavoidable shortchanging of some of their stories. The answer to the mystery itself is one or the more famous outcomes in storytelling, so it was somewhat of a letdown that the different clues introduced became muddled and unclear, with the finale less about putting the mystery together and more about Poirot telling not only us, but the gathered passengers, just how everything fit together. We as an audience are told, rather than shown, how the whole thing connects, and it can’t help but feel a bit underwhelming when the math doesn’t exactly add up. It doesn’t help that on top of being a beloved mystery novel, Murder on the Orient Express has also been adapted a few times before, most notably with the acclaimed version in 1974. Branagh seems to know that this film is starting at a bit of a disadvantage, and makes up for it not only with his all-star cast, but with stunning landscape cinematography and dynamic filmmaking. As a director, he weaves his camera around the train in every physically conceivable manner, including one-cut dolly shots from outside, overhead pans, and expertly choreographed interior sequences. There are even a few times where the action steps outside the train, which has been blocked by a snowy avalanche. The film wisely takes us around the confines of the train, featuring different rooms and cars, as Poirot interrogates the passengers in areas where they’d feel most comfortable. This includes an impromptu picnic in the snow as well as a climactic showdown taken from cramped confines of the train and into a looming tunnel, offering for peak cinematic value. The costumes, hair, and make up are all wonderful, and the numerous sweeping shots of the beautiful train on its travels are genuinely breathtaking. Amusingly, it’s the depiction of Hercule Poirot’s mustache that serves as the best analogy for the film. Previous depictions may have been better, classier, and more subdued, but Branagh knows when and how to get the most dramatic yet cinematic flair out of his story. His film, much like his mustache, offers itself up as a grand, dramatic piece that embraces the sheen and glitz of filmmaking. Sure, it might not be as objectively good as the previous adaptations, but damn does it serve as an impressive looking update to a well-known mystery. Many people might think that’s not good enough, that if you’re going to remake a piece of well-known literature, you need to do it the best or not at all. But Murder on the Orient Express doesn’t come off any worse than any of the recent Marvel adaptations, or any other mega franchises that are currently raking in hundreds of millions of dollars. While the central mystery may fall a bit flat, it’s characters, particularly that of Poirot, and it’s cinematography more than make up for it. We’re constantly looking for the next great adult-focused franchise that doesn’t have to fall back on childish jokes or big explosions on inflated budgets, and this version of Hercule Poirot might be it. It’s fun, gorgeous popcorn to be watching, even if it lacks the depth that many people are seeking out. Then again, we’ve been telling stories for millennia now, so how much can you really expect from an 85-year-old mystery? Sometimes it has to be good enough to sit back, relax, and be taken for a ride rather than be disappointed that every adaptation isn’t something revolutionary. 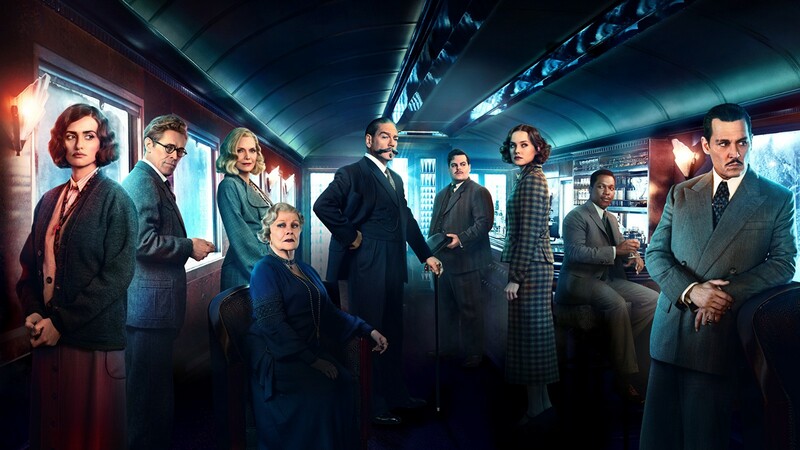 Murder on the Orient Express suffers from being a world-famous murder mystery told numerous times over. Where the real fun lies is in the different portrayals of characters and the sweeping, cinematic gloss that director Kenneth Branagh adds. It’s a gorgeous, lavish film with a weak central mystery. If that’s what it takes to potentially get more of Branagh’s portrayal of the delightful Hercule Poirot, then I’ll gladly have more. The cinematography alone makes this something you should see on the big screen.